A third TV series, it is the prequel of Hakuouki. The story takes place in 1863 as the violent uprising due to political discord disrupt Japan. The Tokugawa shoganate creates the Roshigumi, a masterless group of samurai to aid Aizu forces in Kyoto. However, things aren't boding well for the new police force, as assassinations split the group into two opposing factions. The more powerful faction is led by Kamo Serizawa while the smaller faction is led by the noble-minded Kondo Isami. Enter Ry&#363;nosuke Ibuki: a young man who hates samurai and is forced to become Serizawa's servant due a blood debt. 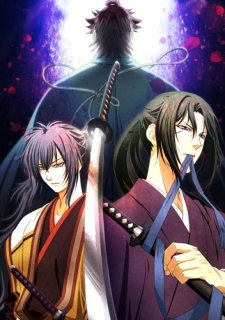 Watch Hakuouki Reimeiroku Episodes Online at Animegg.org. Hakuouki Reimeiroku is available in High Definition only through Animegg.org. Choose an episode below and start watching Hakuouki Reimeiroku in Subbed & Dubbed HD now.